With IPv6 Launch approaching, there is increasing interest in measuring the readiness of the IPv6 infrastructure. A major concern, particularly for networks that source or sink content, is the performance that is achievable over IPv6, and how it compares to the performance over IPv4. A recent study by Nikkah et al. 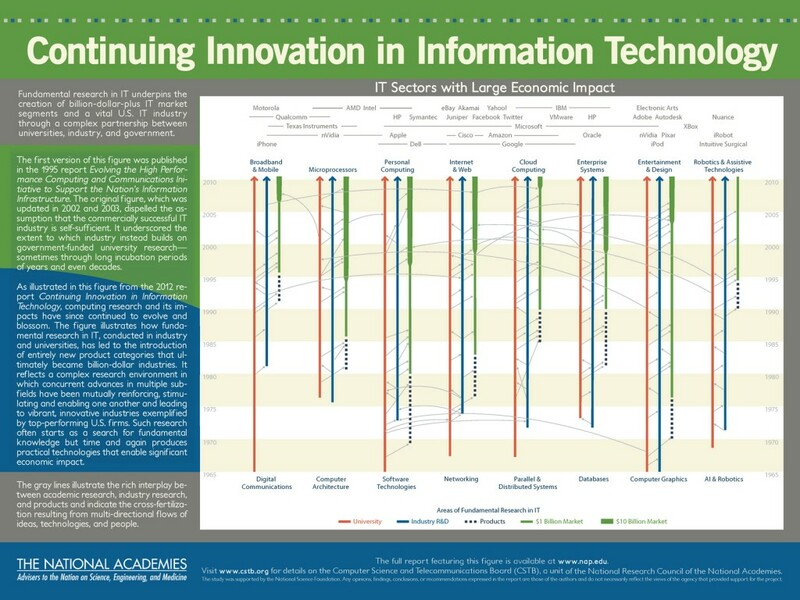 argues that data plane performance, as measured by web page download times, is largely comparable in IPv4 and IPv6, as long as the AS-level paths in IPv4 and IPv6 are identical. 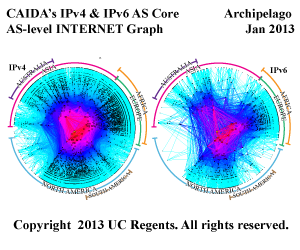 We have confirmed these findings with our own measurements covering 593 dual-stack ASes: we found that 79% of paths had IPv6 performance within 10% of IPv4 (or IPv6 had better performance) if the forward AS-level path was the same in both protocols, while only 63% of paths had similar performance if the forward AS-level path was different. 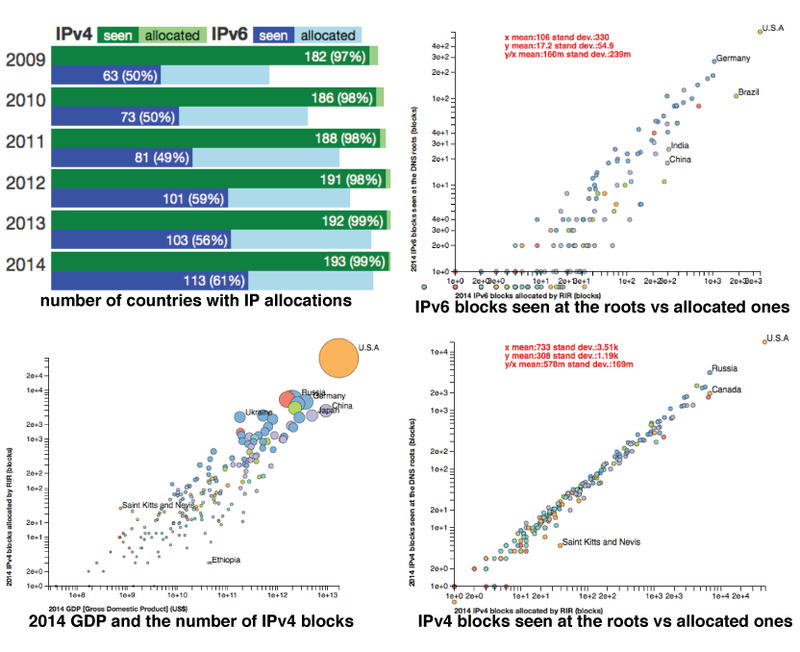 Given the apparent importance of congruent AS-level paths in IPv4 and IPv6, we measured to what extent such congruence exists today, and how this has evolved historically. We measure IPv4 and IPv6 AS paths from seven vantage points (ACOnet/AS1853, IIJ/AS2497, NTT/AS2914, Tinet/AS3257, HE/AS6939, AT&T/AS7018, NL-BIT/AS12859) which have provided BGP data to Routeviews and RIPE RIS since 2003. The figure below plots the fraction of dual-stack paths that are identical in IPv4 and IPv6 from each vantage point over time. 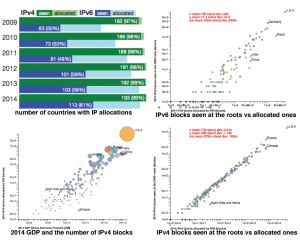 According to this metric, IPv6 paths are maturing slowly. 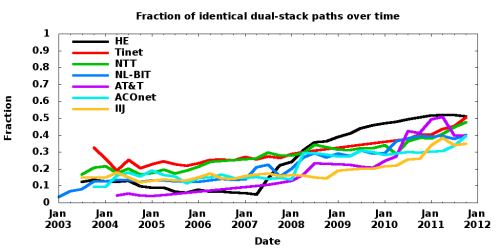 In January 2004, 10-20% of paths were the same for IPv4 and IPv6; eight years later, 40-50% of paths are the same for six of the seven vantage points.